Born: 1803 in Sandwich Ma. 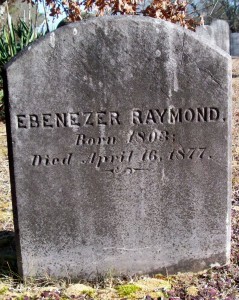 Died: April 16, 1877 in Sandwich Ma. at 75 yrs. 1. Cynthia Padasille Raymond Kendrick; (October 22, 1826 – May 12, 1868); Married Solomon P. Kendrick (Abt.1820 – 1907) (Solomon Kendrick & Phebe Harding) in int. March 2, 1844; Cynthia died at 41 yrs, 6 mos, 20 d. in New Bedford Ma..
2. Anna Raymond Hammond Bassett; (October 28, 1828 – November 4, 1870); Married (1) Jesse Hammond (1821 – 1855) (Noah Hammond & Zilpha Maxim) in Sandwich Ma. on April 14, 1851 & married (2) William N. Bassett (1808 – 1878) (Edmund Bassett & Mary/Polly (–)) in Sandwich Ma. on December 16, 1858; William married (1) Mary M. Backus (Abt.1814 – 1846) in int. January 5, 1833 & married (2) Roxanna S. Goodnow (Abt.1810 – 1858) (Lewis Goodnow & Jerusha (–)) in Sandwich Ma. on November 26, 1846. 3. Sylvanus Harlow Raymond; (November 18, 1830 – February 26, 1875); Married Sarah Ann Fowler (1830 – 1912) (Phillip G. Fowler & Olive (–)) in Sandwich Ma. on December 22, 1853; Sarah married (2) Henry C. Green (1833 – 1898) (Zebedee Greene & Betsey F. Swift) in Dorchester Ma. on December 21, 1882; Sylvanus, Sarah, Henry & Sylvanus’ daughter Sadie F. Raymond are buried together in Pocasset Cemetery. 4. Cordelia Williams Raymond Perry; (April 28, 1833 – May 6, 1905); Married John Moffett Perry (1824 – 1906) (Prince Perry & Abigail S. (Perry)) in Sandwich Ma. 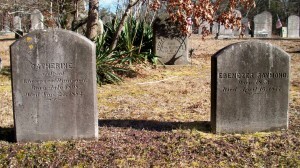 on December 21, 1853; Cordelia & John are buried in South Monument Cemetery in Monument Beach Ma..
5. Sophia Ellis Raymond Hubbard Smith; (December 30, 1835 – December 5, 1896); Married (1) John Hubbard (Josiah Hubbard & Margaret (–)) in New Bedford Ma. on August 30, 1857 & married (2) Israel S. Smith (1825 – 1912) (Israel A. Smith & Betsey Wilkinson) in New Bedford Ma. on January 3, 1859; Israel S. married (1) Betsey R. Jones (Simon Jones & Michel M. (–)) in Taunton Ma. on May 9, 1850. 6. Lydia Cook Raymond; (June 17, 1838 – February 8, 1839); Lydia died at 7 mos. ; She is buried in Pocasset Cemetery. 7. 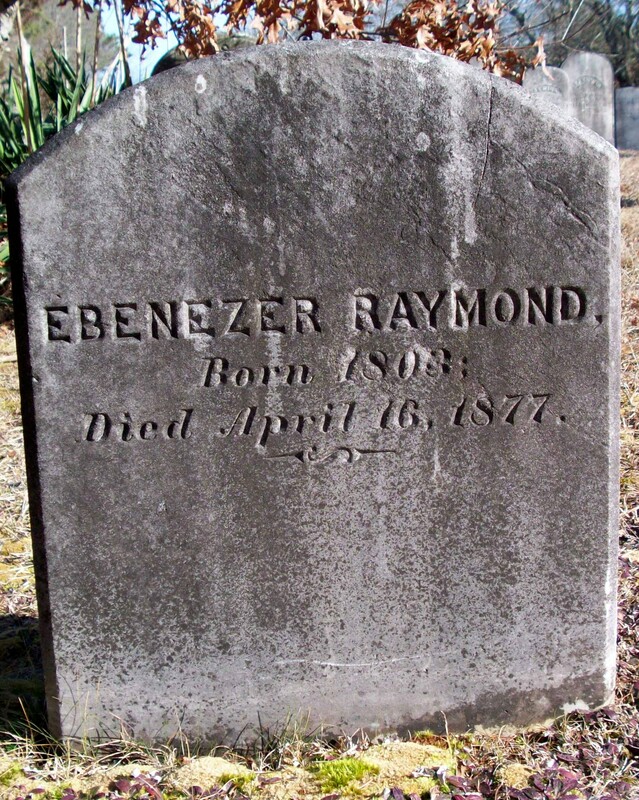 Ebenezer Raymond; (July 26, 1842 – ? ); No further information. 8. Isabell Frances Raymond Kendrick; (January 12, 1845 – August 7, 1912); Married Freeman Berry Kendrick (1845 – 1909) (Warren Kendrick & Bethia Phillips) in Sandwich Ma. on January 14, 1867; Isabell & Freeman are buried in Pocasset Cemetery. 9. Catherine Raymond; (October 1847 – February 13, 1848); Catherine died at 6 mos, 29 d..
10. John M. Raymond; (November 14, 1850 – May 20, 1850); (confusing birth & death dates in Sandwich Vital Records); John died at 6 mos, 6 d..